Eurasian reed warbler: By Martien Brand from Mariënberg, The Netherlands (29601 Kleine Karekiet / Reed Warbler) [CC BY 2.0 (http://creativecommons.org/licenses/by/2.0)], via Wikimedia CommonsWe all marvel at those mammals, birds and insects who migrate long distances, and at their innate ability to reach a destination thousands of miles away. One of the problems thrown up by covering long distances is how to estimate your current position. While latitude was a relatively simple problem to resolve, it took human geographers, map-makers, scientists, clock-makers and mariners centuries to resolve the problem of how to locate themselves longitudinally, or on the west- east axis, as they crossed vast oceans. The system which eventually resolved the problem for human explorers involved accurate time-keeping. In Europe, this difference between the true and magnetic north, increases as you move from east to west. When using a map and compass, this changing declination needs to be accounted for, especially if you are to reach a long distance destination. It would appear that the birds detect the declination or variation between the true north and the magnetic north, and from that, their longitudinal axis. Writing in the current issue of Current Biology (August 2017) an international team of biologists, including Richard Holland and Dmitri Kishkiniev of Bangor University's School of Biological Sciences, explain how they identified for the first time, that mature reed warblers are able to detect the declination from magnetic north, and use the scale of the declination or change from true north to geo-locate themselves to a longitude, from which they orient themselves towards their autumnal migration from Russia to Africa. 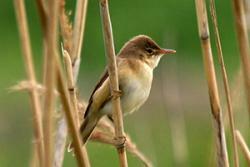 In a bid to prove their theory, the group temporarily caught both mature and juvenile Eurasian Reed Warblers. Holding the birds in small funnel shaped cages that record their orientation tendencies, the team recorded the birds’ tendency to orient towards their migratory route from Russia to North Africa before changing the magnetic field around the aviaries to represent an 8⁰ variance from true north (reflecting Aberdeen’s actual declination). Still contained within orientation cages, mature birds were found to temporarily orient themselves as though they were embarking on a migration from Aberdeen, around 900 miles away from their location in Russia! The immature birds appeared confounded by the new magnetic signal and were not able to orient themselves, suggesting that this magnetic map is learnt by experience. The group have opened a window to reveal one system which these birds, and possibly other species use. The revelation however raises as many questions as it answers- how do the birds detect the magnetism? How do they learn the map?